This humorous, true-to-life guide presents a running conversation between two friends who bring the Depression era in New York City’s boroughs to life. It celebrates simpler times when what you ate was based on your economic means; natural exercise was an inherent part of your day; food was basic, fresh and healthy; and the rhythms of neighborhood life were part of growing up. 92-year-old Sam Bloom offers childhood remembrances of the Jewish ghettos of Brownsville and East Flatbush, Brooklyn, while 89-year-old Al Johnsen vividly recalls growing up in a poor Norwegian part of Queens and offers a crash course on the finer points of stealing day-old bread, copper wires, and pennies from newsstands. 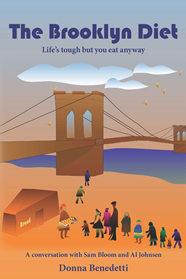 Committed to print by Donna Benedetti, Sam’s wife, the stories share the common theme of food: how food was prepared; where meals were eaten; and what they could and couldn't afford to eat. Conversations cover a variety of topics, including the perfect New York cheesecake, pushcart peddlers, street games, and home remedies. Alongside are jokes, original artwork, photos of the era, and unique recipes by Al and Sam. Harkening back to an era when people depended on their communities for food, friendships and survival, this delightful diet is a recipe for a life that is sustaining, sweet, and in every way delicious.